Honda has announced its line-up of exhibits for next year’s Tokyo Auto Salon, which opens its doors in just a couple of weeks. The list includes five concepts that are based on existing and even upcoming models. 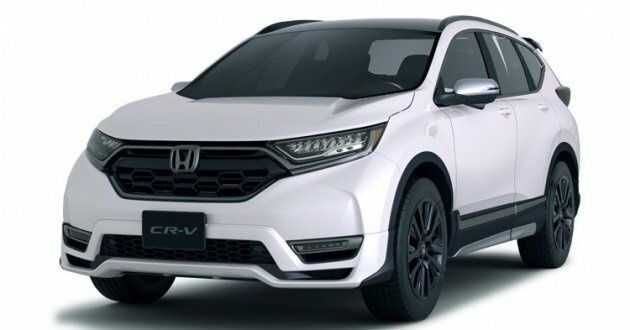 The first is referred to as the CR-V Custom Concept, and comes fitted with Modulo parts like new bumpers as well as 19-inch alloy wheels. There’s also a new grille design and rear wing, with selected areas of the SUV being painted black as a sign of its sporty ambitions. Next up is the Jade RS Custom Concept, which Honda says is based on an updated Jade RS that will be released in Japan later in spring 2018. It too gets kitted out in Modulo items such as a black chrome garnish, along with a lowered ride height of about 15 mm. The Modulo treatment also gets applied on the latest iteration of the StepWGN to create the StepWGN Modulo X Concept. Similar to the Freed Modulo X, which will also be at the show, the MPV concept serves as a preview for an upcoming variant, and gets its share of add-on components too. For something a little sportier, there’s the S660 Modulo X Concept. Featuring a full aero kit that includes new bumpers, the roadster also comes with adjustable dampers for its suspension system. The Mugen division meanwhile, will bring along the Civic Type R-based RC 20 GT. Other models being showcased are a Mugen-tuned Civic Hatchback Prototype, the NSX, Civic Type R, N-One RS, plus an array of racing cars and motorcycles. Pls revive the C-RV EuroR. Kamsa hamida..
when you hear the brand name Honda, you will think a market leader. a brand trusted by many and it will come back with better models and setting the benchmark higher than its competitors. every model they come out got good resale value and will sell well in malaysia and worldwide. Honda got good resale value and will sell well. All credits to Drb malaysia. You mention ‘every model’ will sell well? Explain Freed, hahahahahaha..